On 2 June 1953, Elizabeth II was crowned at Westminster Abbey. Six decades on, England will be celebrating her 60-year reign with a range of events right across the country, from river pageants and Big Lunches to concerts and a royal appearance by a miniature (10 cm!) monarch. Here, VisitEngland highlights just a few of the celebrations fit for a Queen. This one-off event in the gardens at Buckingham Palace will see over 200 companies with the prestigious Royal Warrant of Appointment exhibiting. By day, visitors will be able to explore and enjoy the Buckingham Palace Gardens, which will feature four areas showcasing the very best of Food & Drink, Design & Technology, Homes & Gardens and Style, Pursuits & Pastimes. By night, visitors will be taken on a musical tour of the Queen's 60-year reign, with performances by the National Youth orchestra, the English National Ballet, Katherine Jenkins, Russell Watson, Katie Melua, Laura Wright and The Feeling. Be quick, there are just a handful of tickets left. Her Majesty The Queen has given permission for a unique regatta to take place on the River Thames at Windsor Castle to celebrate the Coronation anniversary. Rowing crews will race side-by-side over a distance of 1,000 metres between Prince Albert and Queen Victoria bridges, and spectators will be granted entry into the normally private grounds of the castle to watch the race. This special event will be the first regatta on the Thames at Windsor for 44 years. The Queen of Miniland will put on her real crown jewels in Windsor this May Bank Holiday before taking a carriage north for a guest appearance in Manchester. 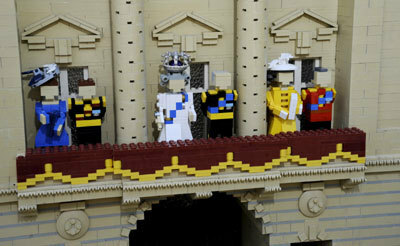 Visitors can watch the tiny 10 cm high LEGO model of Her Majesty The Queen, complete with a 48 tiny cut diamond encrusted crown, twinkle as she waves from the balcony of her miniature Buckingham Palace, alongside minute figures of the Duke of Edinburgh, Prince Charles and the Duchess of Cornwall, the Duke and Duchess of Cambridge and Prince Harry. Adult tickets start from £34.20 and children from £27.45. A new exhibition of archive pictures of the 1953 Coronation is now on display at Westminster Abbey until the end of September. The Abbey has partnered with Getty Images to include some of the best black and white news pictures of the time alongside some never-seen-before pictures illustrating the pomp and magnificence of the joyous celebrations which swept the nation. The exhibition is free although entry charges to the Abbey still apply. The Abbey is also hosting a Coronation Gala on 13 June conducted by Organist and Master of the Choristers James O'Donnell and performed by the Quire of Westminster Abbey. The concert will feature Coronation music through the ages - tickets start from £20. To mark the 60th anniversary, the Coronation River Pageant will showcase 130 classic and traditional boats on the River Thames at Henley. The boats will be moored at Marsh Meadows and will travel upstream to Phyllis Court Club before making the journey back. Boats will be dressed for fun with plenty of bling, colourful characters and historic look-a-likes. Benjamin Britten's Gloriana was commissioned by the Royal Opera House to mark the Coronation of Elizabeth II in 1953. This year marks the centenary of this great composer and to mark the occasion, Richard Jones is directing a new staging of the opera, which explores tensions between affairs of the state and of the heart. Ticketsstart at £9. In June 1953, the townspeople of Ledbury in Herefordshire rallied together to hold a huge Ox Roast to celebrate the coronation. Now, 60 years on, the community has come together again to recreate this special event. You don't have to be local to attend, everyone is welcome. Dust off your bunting and start packing your picnic as Broad Street in Chipping Sodbury prepares to welcome one and all for The Big Lunch. The market town also plays host to a three-day jazz festival from 31 May - 2 June to keep everyone in celebratory Coronation spirits. Winchester Cathedral is celebrating the 60th anniversary of The Queen's Coronation with vintage glamour. Enjoy a cocktail on arrival and a delicious three-course dinner before donning your blue suede shoes to rock around the clock and shake, rattle and roll with 1950s-style band The Cadillacs. Tickets cost £39.50 and include a welcome drink, three-course dinner and coffee.